“A short time ago the artistic world discovered that on garden gates, farm fences, etc., there was a most lovely blue-green colour to be seen sometimes. This was Brunswick green in a state of dilapidation, and was showing that it needed re-painting. However, the colour was so lovely that many attempts were made to copy it in new paint. They all failed hopelessly. One cannot with paint fake the work of time”. These words of Basil Ionides, written in the 1930s, came to mind when I was talking to the owner of a large country house in Norfolk. 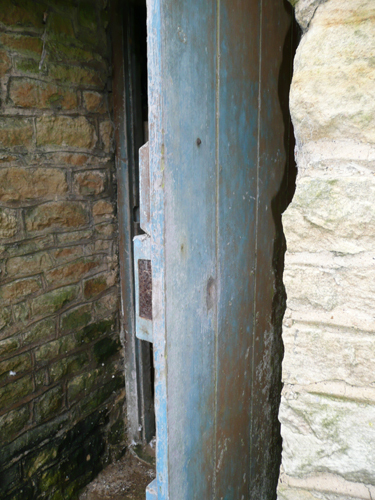 Papers and Paints had been requested to devise a good blue colour such as (we were told) “had always been used on the gates and doors around the estate”. 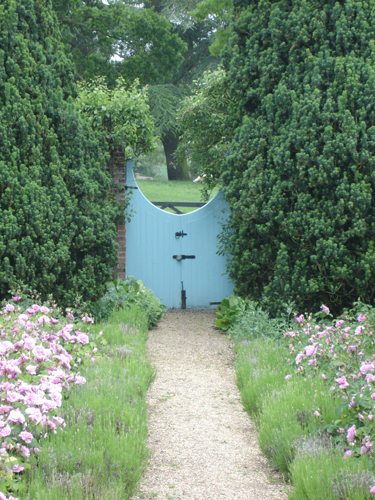 Several years ago I was commissioned to investigate the exterior paint colour in the National Trust’s famous Hidcote Manor Garden. 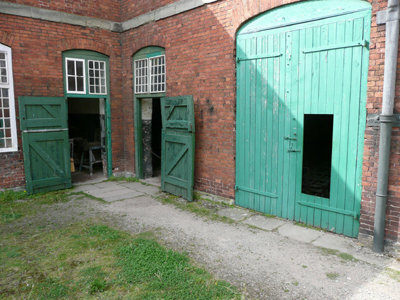 For the last forty years the well-known bluish green has been used, however analysis has shown how this was a misinterpretation of the earlier Brunswick green. Perhaps surprisingly the original colour appears to have been brown. 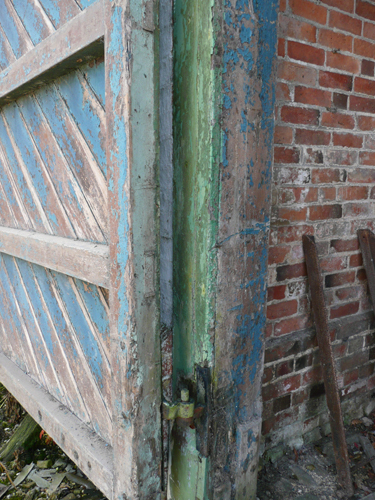 Although modern paint no longer ‘chalks’ as an old lead paint does when it ages the colour still wanders. 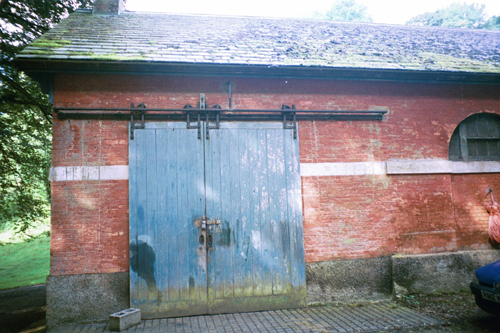 This can be seen on these stable doors after a few years exposure to the elements. 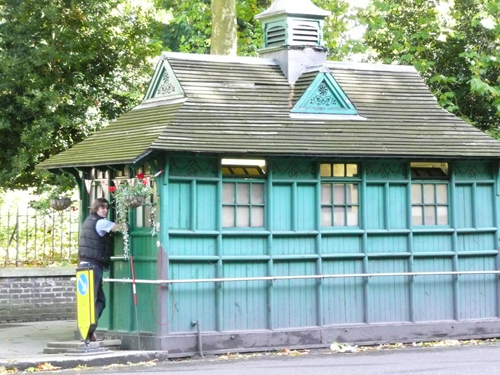 Brunswick green ‘on the turn’ – the colour becoming noticeably bluer and paler. In recent years blue seems to have become a popular colour for such surfaces even though it was seldom used on external woodwork in the past. 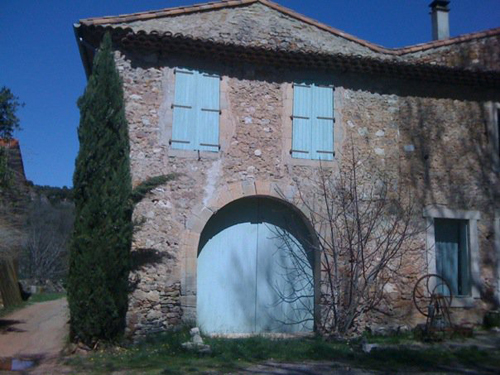 Another colour with which it is confused is the one frequently referred to as the generic “French Château Shutter Blue” (could it be that there is more than one?) by several customers who have heard of our range of paint colours based on some of those seen across the various regions of France. Even when aware of this phenomenon one often needs convincing. 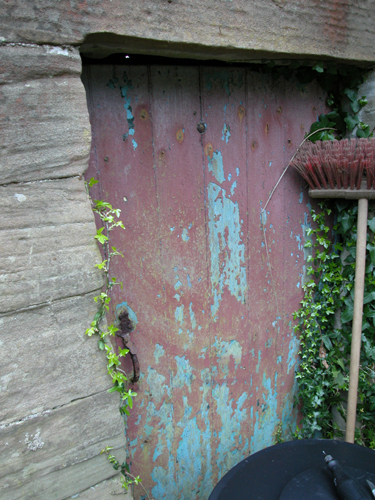 Whilst carrying out the analysis of the paint on the estate buildings at Culzean Castle, in Ayrshire, a red-brown door to the Kitchen Garden was seen to display an earlier scheme of greenish-blue. 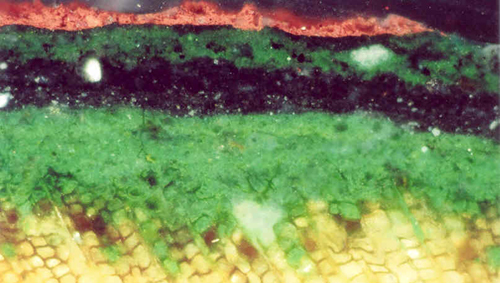 A thin blue crust can be seen where the overlying red-brown has already flaked off. 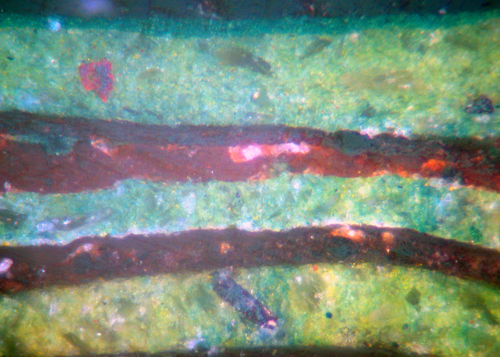 However where the red-brown is scraped off the underlying paint shows green. Here is another example recently encountered on a set of Soane-designed outbuildings in Northamptonshire. A slideshow of these buildings can be seen here. I have termed this phenomenon the “Penrice Effect” after the house where I first encountered it. There are many myths that have arisen in the world of paint and colour. A number of these will be addressed in subsequent blog posts. I suspect this is a light (probably strong uv) effect – on one of your pictures (‘Sulby Park Door’) it appears that the part of the paintwork covered by the door when closed still appears green. The easy test of this theory is by information you have access to – do the indoor parts of doors with paint remain green? or have they been affected in the same way too? Thank you. ‘Flooding’ was a word that I had read (possibly in Hess) to describe this action. Yes, of course UV has a major part to play and it doesn’t happen where the green is hidden from the light. You can see in the cross section how the Prussian blue rises to the surface. Yes. I hadn’t paid so much attention to the cross sections but it’s clear from them that there is concentration of pigment at the surface. Excluding preferential wash out of yellow (which the surface concentration of Prussian blue tends to preclude) the idea of a flooding effect over a long period of time seems like a fair explantation – it well known that paints remain far from fixed solids even years after the can be considered dried. I did initially wonder if your Brunswick Greens were very old and had a Copper Oxychloride based green which has an obvious route to copper carbonate (via atmospheric CO2 and water) / copper fatty acid salt (from reaction with the paints emusifiers) -these are green blue to deep blue depending on conditions of formation – mostly pH – generally very similar in hue to copper patina. The idea is attractive in its simplicity but I don’t think it is correct in this case. The author goes on to state that Brunswick greens usually darken – an observation repeated elsewhere in the case of paintings exposed to light – this makes me think that exposure to water is necessary for the bluing effect. 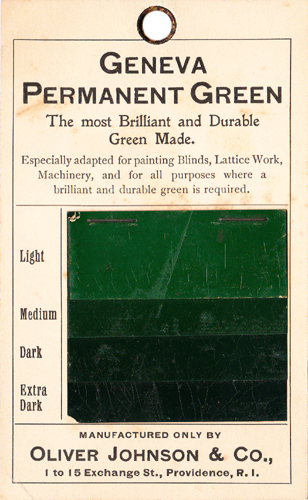 I also enjoyed your post on ‘invisible green’ by the way – I’ve come across this term once before – as it was used as the colour for the liveries of the locomotives of the Hull and Barnsley Railway – according to the literature this particular invisible green was so named because it appeared completely black, except in the brightest sunlight – under which it took on a slightly green tint – the recipe for this pariticular version was a 50:50 mixture of drop black and brunswick green. Thank you for adding so much to our understanding of this phenomenon.